Product prices and availability are accurate as of 2019-04-22 09:44:23 UTC and are subject to change. Any price and availability information displayed on http://www.amazon.com/ at the time of purchase will apply to the purchase of this product. 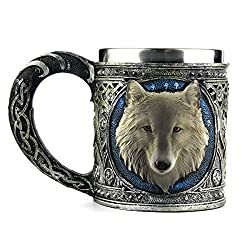 This wolf head tankard could be a great gift for your family and friends. Vintage wolf mug with exquisite design and craftsmanship, 3D vivid pattern, great for the wolf lover. This cup/goblet may be exist some smell , could not wash by the dishwasher, you just use some brush to clean it . Photos just for reference, color may be slightly different from the photos, all please refer to our actural items, thanks. When receiving it,there are some tips for you. tips 1: You can use with two fresh lemons into the cup, and then cover the lid, a few hours should be able to. tips 2: Directly wipe with the used tea, and then put a few days and then use. 1pcs of wolf cup/goblet ONLY. High Quality Wolf Goblet: Stainless Steel Wolf Goblet made of Resin + Stainless steel material with creative 3D realistic wolf head design, full of mystery and vintage feeling. Unique 3D patterns: Ornamental prints and patterns on the handle and surface, more exquisite and unique. High Temperature Resistance: Has a high temperature resistance features, suitable for the various needs. Great Gift Idea: Could be a cool home/office/table decoration, it's a great gift for you, you BFF, lover, and family on some special days. Product Size: Goblet Size: Measures approximately 7.67 inch tall, 2.95 inch diameter; Net weight: 420g.Mug Size: 4.25 inch in tall, 3.75 inch in diameter.